Going to Evergreen Upholstery on Burwell Street is like a trip back in time. 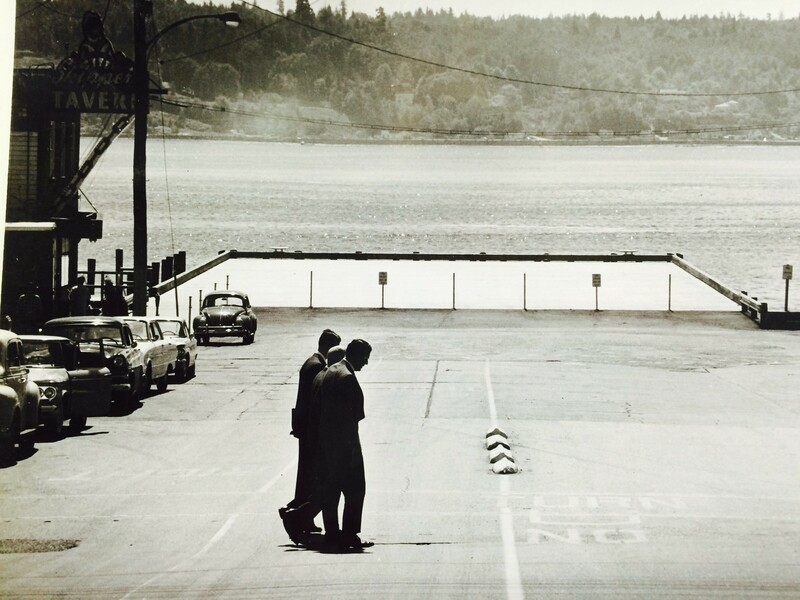 Not only has the store seen Bremerton through the decades — it’s been in the same spot since 1955 — but owners James and Joanne Welch have a passion for the city and its history. 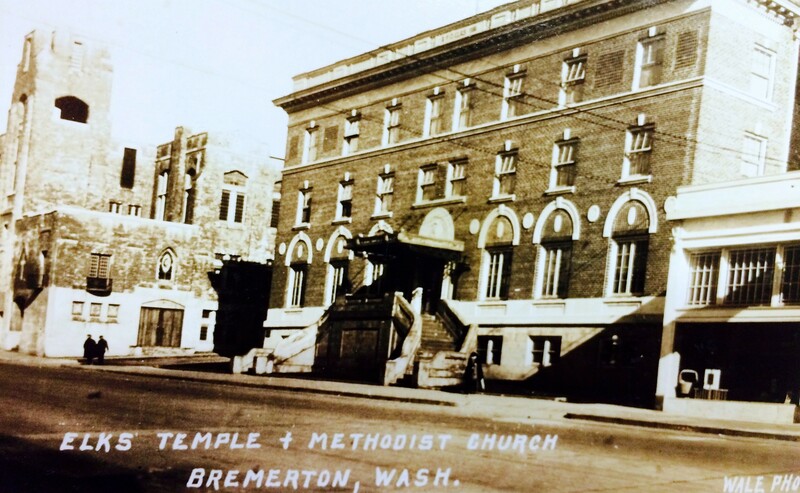 The Welches have long collected postcards and other photos of the city. While interviewing them for a story about their business and the pending plan to build 48 apartments there, they let me take a few pictures myself of their amazing collection. I am sharing them with you now, alongside a more current photo of the place that was captured. 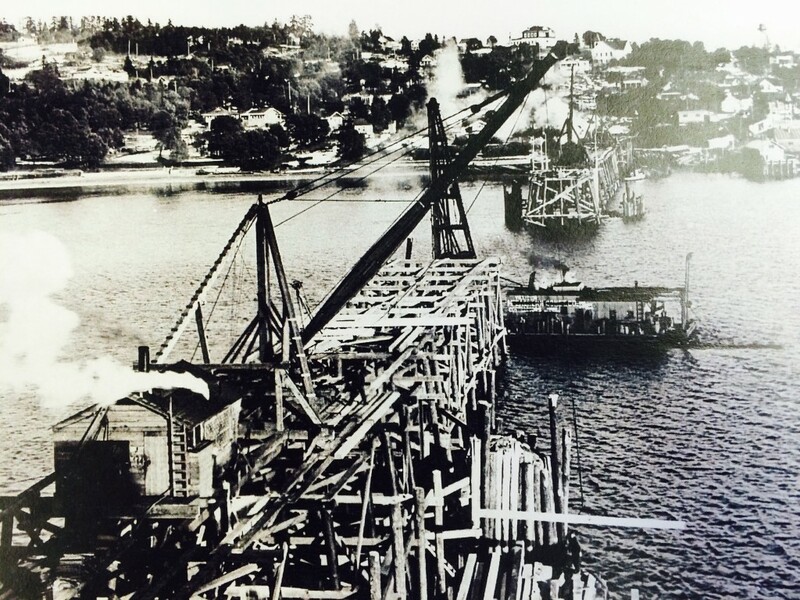 The first Manette Bridge opened in 1930; here it is under construction and, once built, is its toll booth — complete with brick fireplace. 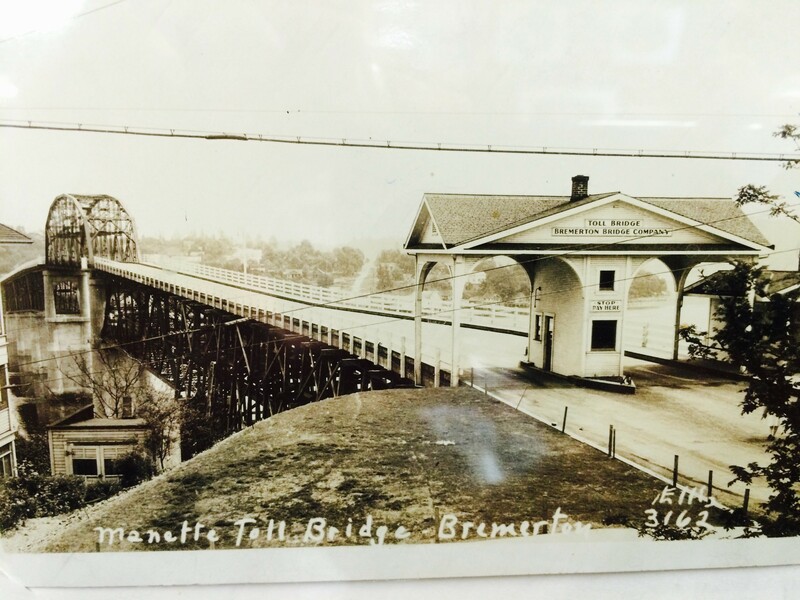 The bridge was tolled twice; once at its inception and later when the Warren Avenue Bridge opened. 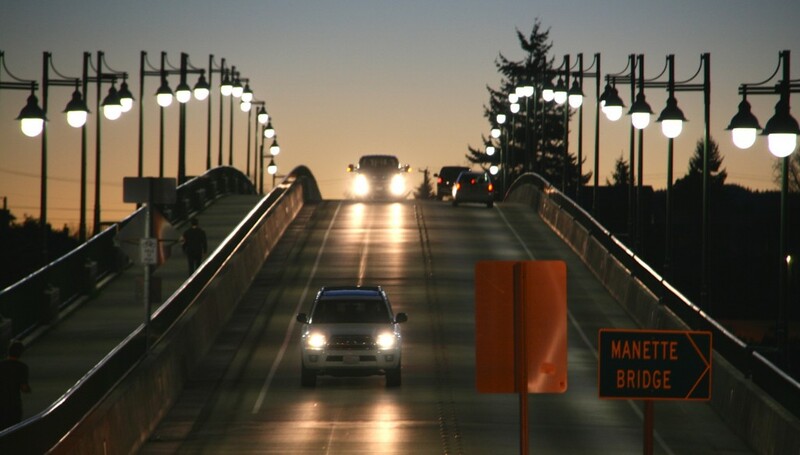 The second Manette Bridge, also pictured, opened in 2011. Some of you have lived here long enough to remember the pool at Evergreen-Rotary Park. But what about the pavilion? 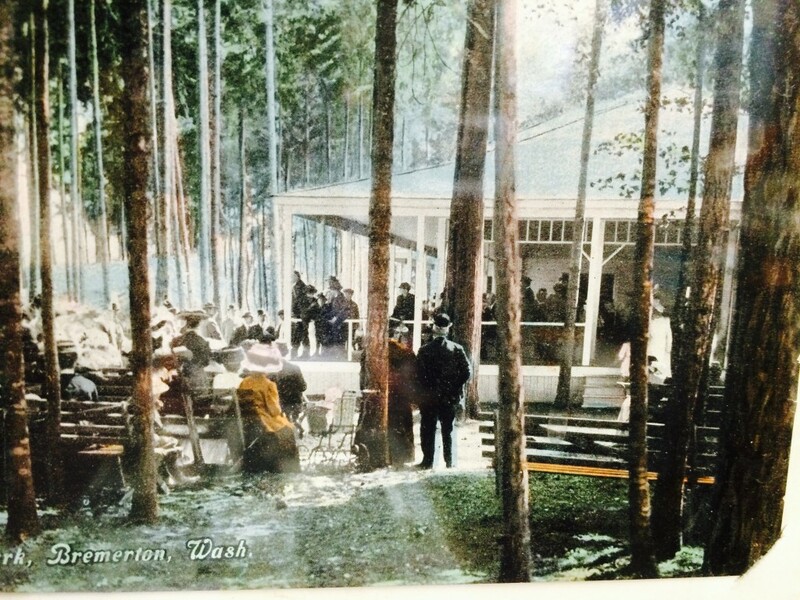 The park originated at the northernmost section that exists now, so I am guessing that’s where this pavilion was. Also, something else I find interesting is how much the park has grown over time. And by grown, I mean has protruded out and over the Port Washington Narrows. 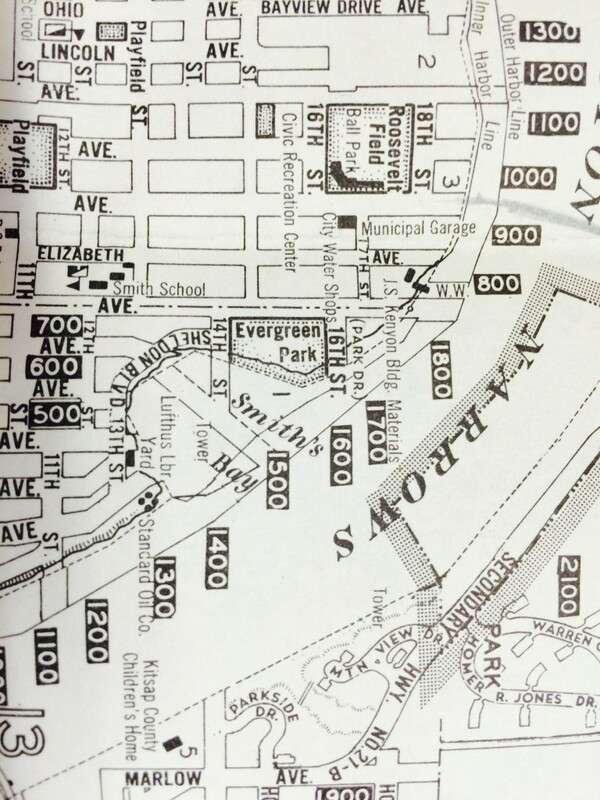 If you notice, what we now call Smith’s Cove used to be Smith’s Bay, according to this circa-1960 map. The waterline appears to come all the way up to Sheldon Boulevard. My guess is that much fill went into the water but if anyone has a more thorough explanation, I’d love to hear it. The Navy built Building 50 within the first five years of the Puget Sound Naval Shipyard’s existence, in 1896. In the above photo, it’s the one on the right. It was first a headquarters for shipyard commandants. The building moved around until finally settling down in 2007 to house the Puget Sound Navy Museum, next to the shipyard and ferry. 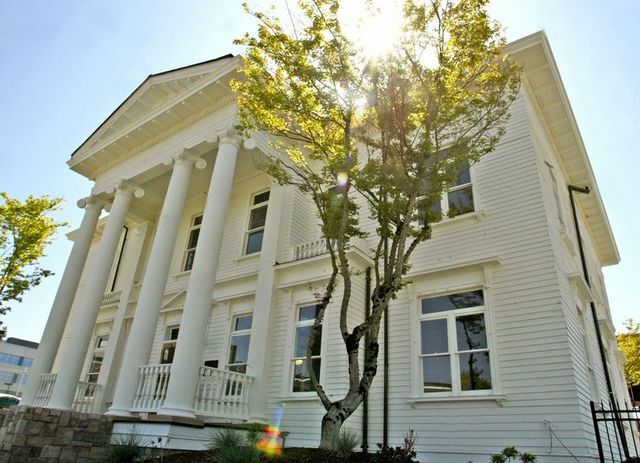 Bremerton’s brick-lined Elks Lodge has long since been converted to housing for the Max Hale Center. But I had no idea of the grand staircase that once greeted visitors. Those stairs would be removed when the Pay Less store moved in, occupying a white cube of a building that still exists today. You might also note that there was a Methodist church where the Chase Bank building is now. So much has changed. You’ll note the Kalakala ferry in the first photo (bottom right); and in the second photo, taken on Second Street, you’ll see Skippers Tavern. You can read more about it here, in a Sun story by Travis Baker. And those men walking in the street? They’re the Bremer brothers, John and Ed, who reportedly always walked that closely together with their business manager around town. 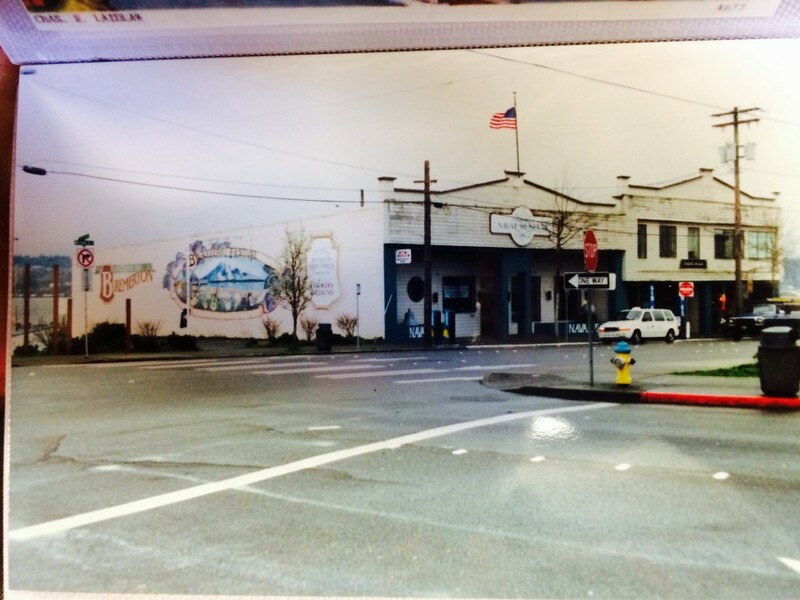 The third shot shows the old Bremerton ferry terminal while the fourth, complete with a Blackberry Festival mural, shows the corner where the Hampton Inn now sits. Because some things never change. Be sure to read the note on the front of the register. for “dragging main” too fast? 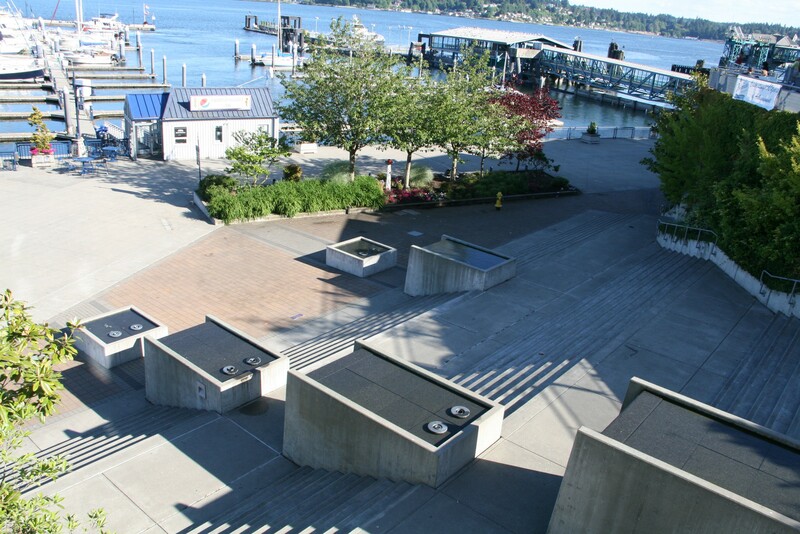 Bremerton is all gone now, so SAD. I loved your brother Joe. He shepherded me into police work back in 1972. And I saw both him and Barb at our breakfast get togethers last summer before they passed. Gotta go. Time for another breakfast. Growing up in B town in the 60-70’s … Seeing this article and photos definitely brought back memories. I used to swim at the Memoria Park pool, everyday in the summer. My sister Cathy and I would either walk or ride our bikes … Our dog “Kully” would unbeknownst to us follow behind and we would see him playing with people in the park from the pool deck. I think it was either .25 or .50 to swim. I can still hear in my head to this day the distinctive sound down the diving boards and wire baskets clanking about down in the changing areas. The old Admiral theater.. I delivered newspapers there when I was just 13. 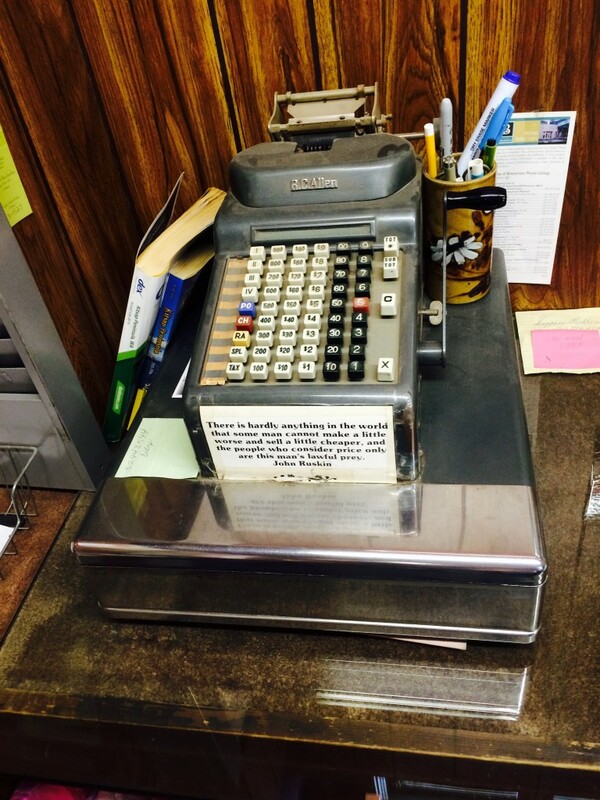 And my first “real” job was at the soda fountain counter at Booths Drug Store. The old Elks lodge your article mentioned is now named after my dad “Max Hale”, he was a humble man who did many wonderful things for the community and help me become the person I am today. Thank you – it was fun to see the old & new photos. I grew up at our home on Park Drive at Evergreen Park attending Smith Elem, Coontz JH and West HS grad 1964, then Olympic College 2 years & elsewhere for BA degree. Many good memories. Evergreen Park was much changed after a huge windstorm took out a lot of trees – seemed sad but upside was it brought a lot more light and sunshine to area. The park had avery large wading pool for us kids and adjacent was my favorite building, a small covered “bandstand”. Some official decided it was to be torn down rather than painted…I remember we kids begging – to no avail – to volunteer to paint it so it would not go away. Our next door neighbor was the sheriff – he had quite the greenthumb with his gorgeous begonias. 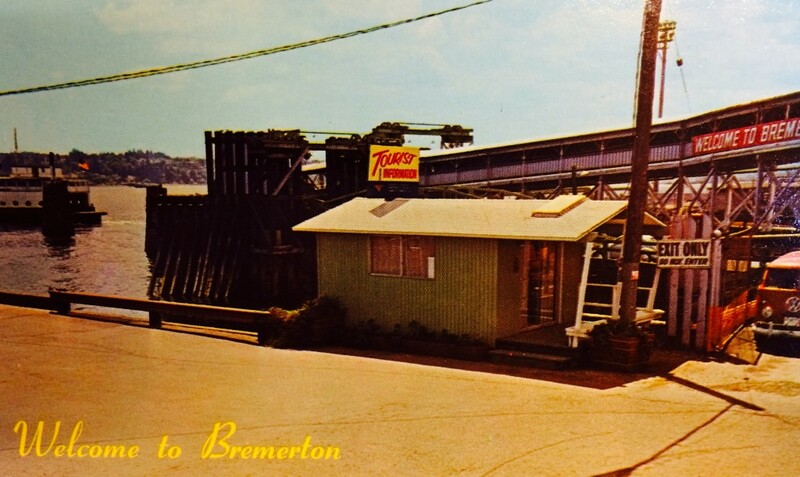 Please feel welcome to ask me questions about Bremerton from the era of 1050s-60s especially. I moved to Port Orchard 1969. West High 1978, last graduating class. 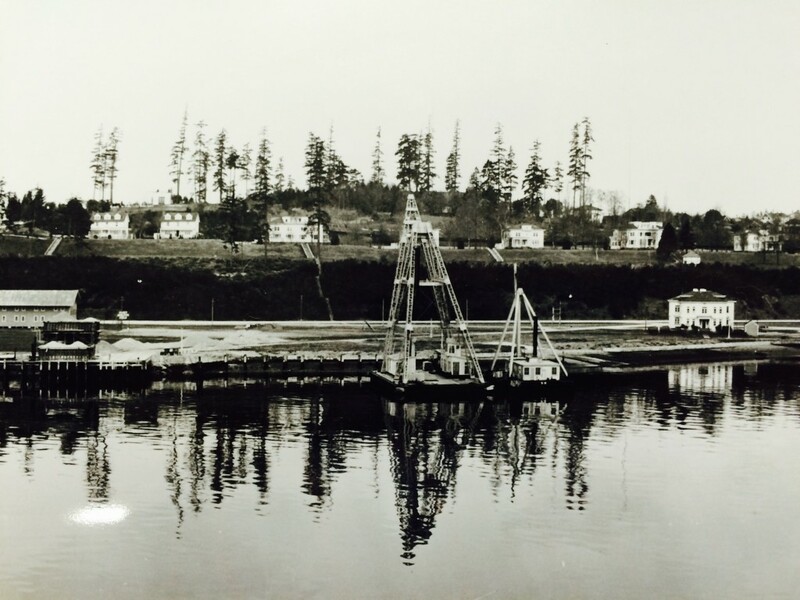 Evergreen Park (water area) was one of Bremerton’s first dumps (probably a combination of refuse and drydock spoils. Lions field is the same. There was a lake where the Puget power substation is now was connected to Smith Bay with a low creek there was also one where the warren Ave Playfield (Dietz lake) a low area extended from a marsh at the site of Drydock No 1, up Park avenue almost to the (lake) at the Puget power site thus nearly cutting the area in half by a low marshy area that extended north to south through town. 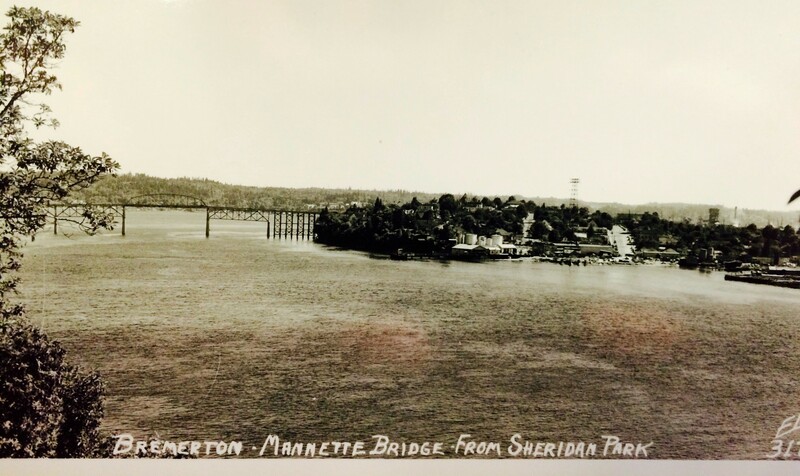 Bremerton’s first water source was at the south end of Park Ave at this marsh. Another low marshy area in the Charleston townsite extended up the Montgomery St lowland in the Naval base (Marine Headquarters’ ballfields) That whole part of town was filled with materials from the entire PSNS waterfront as they cut down the bluff and built drydocks.